Wherever you go on New Year’s Eve, please celebrate responsibly: Metro is offering free fares on all Metro Buses and Metro Rail Lines on Dec. 31st, and Y Drive or a taxi is just a phone call away. 213 Nightlife is going all-out with a New Year’s Eve Downtown LA crawl that takes place at eight of its bars. (See below for what’s happening at The Varnish.) 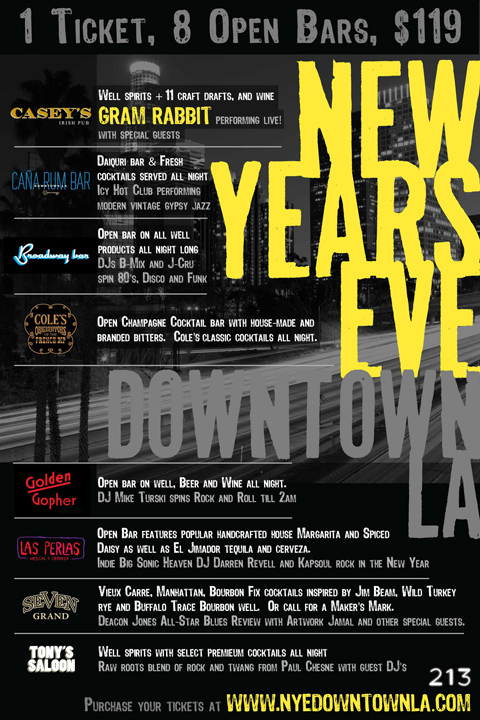 For $119 General Admission, New Year’s Eve revelers can enjoy a plethora of unlimited drink offerings, midnight champagne toasts, and live music at Broadway Bar, Caña, Casey’s, Cole’s, Golden Gopher, Las Perlas, Seven Grand and Tony’s Saloon. 213 is offering a special $99 early bird price to the first 200 guests to purchase tickets online. Casey’s Irish Pub – Open bar well spirits, 11 craft beers and wine. Gram Rabbit live, Special Guest DJs. Broadway Bar – Open bar on all wells, all night. DJs B-Mix and J-Cru spin 80’s, Disco and Funk. Cole’s French Dip – Open Champagne Cocktail Bar with house-made and branded bitters, plus Cole’s classic cocktails all night. 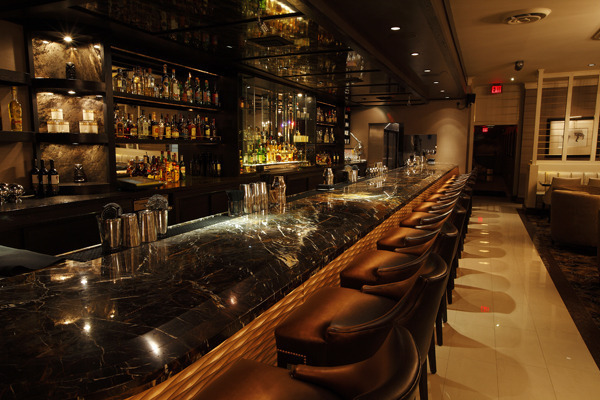 Golden Gopher – Open bar on wells, beer and wine all night. DJ Mike Turski spins rock ‘n’ roll til 2am. Las Perlas – Open bar features the Las Perlas House Margarita, Spiced Daisy, El Jimador Tequila and cerveza. “Indie Big Sonic Heaven” with DJ Darren Revell and Kapsoul. Seven Grand – Vieux Carre, Manhattan, and Bourbon Fix cocktails featuring Jim Beam Rye, Wild Turkey Rye, and Buffalo Trace Bourbon well spirits. Or call for Maker’s Mark. Music by Deacon Jones All-Star Blues Revue, with Artwalk Jamal and Special Guests. Tony’s Saloon – Open well bar with select premium cocktails all night. “Rock and twang” with Paul Chesne and Guest DJs. The General Admission ticket allows entry to the eight bars included in the event. However, the ticket does not guarantee entry; for obvious safety reasons each venue must observe its respective capacity limit. With that in mind, 213 Nightlife is also offering a limited number of $250 VIP tickets. These no-wait line passes guarantee entry and ups the ante to premium pours at all eight bars throughout the night. Needless to say, whichever ticket you buy, early arrival is strongly suggested. The Varnish will be dancing to its own beat on New Year’s Eve, with an all-inclusive $125 ticket that features unlimited craft cocktails, bottomless punch, a “Served with a Twist” contest, and more. Tables in the intimate venue are available for parties of two, four and six. Seating for New Year’s Eve is very limited; for reservations contact Varnish GM Chris Bostick at (213) 622-9999, or email thevarnish@varnishbar.com. 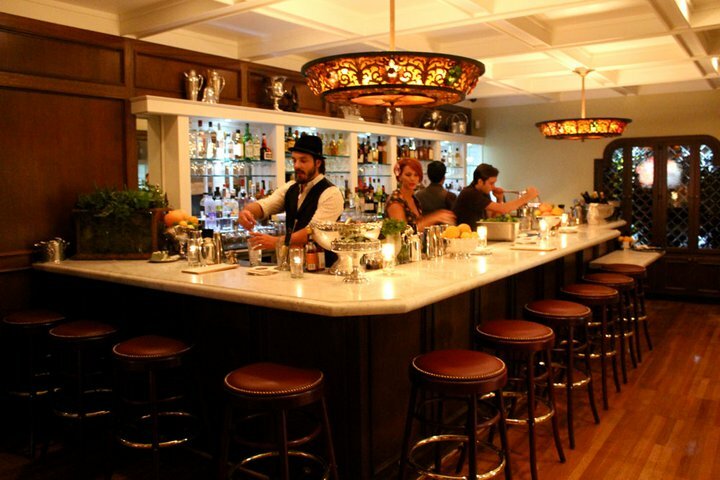 1886 Bar / The Raymond – Good Old Days Are Back Again! 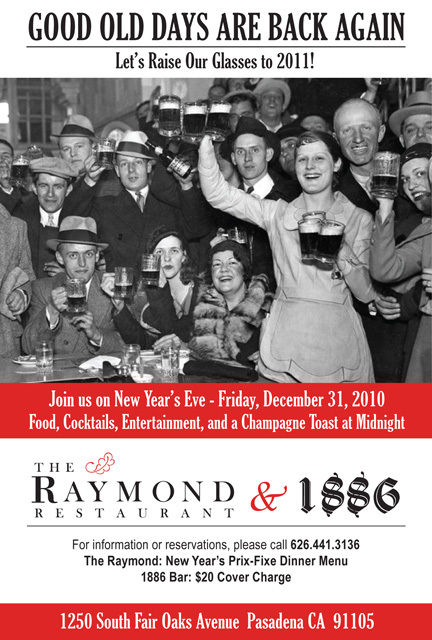 Nothing like a new year to start fresh, and with that in mind, Pasadena’s 1886 Bar and The Raymond welcome 2011 with the optimism and nostalgia of Good Old Days Are Back Again! 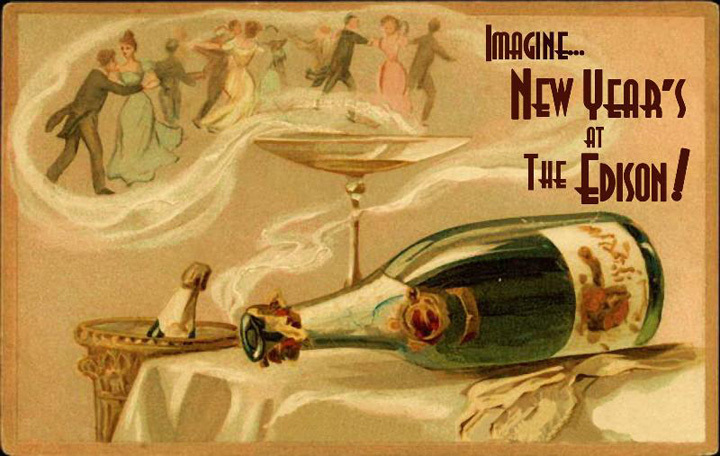 For a $20 cover, guests at the recently-opened 1886 will enjoy entertainment, champagne toast and special bar menu. The Raymond will offer guests two dinner seatings on New Year’s Eve. The early and late seatings will each have prix fixe menus that feature Chef Tim Guiltinan’s innovative, contemporary cuisine. Guests who opt for the late seating will also enjoy party favors, entertainment and a midnight toast. Dinner reservations can be made at (626) 441-3136. Since taking over Bar | Kitchen in October, Alex Day and David Kaplan (Proprietors LLC) have revitalized the O Hotel’s restaurant and lounge with new menus and an understated interior that more closely matches the boutique hotel’s classy vibe. For New Year’s Eve, Bar | Kitchen offers its mix of high quality and affordability with two options: a Prix Fixe Dinner and Booze & Bites. The Booze & Bites Menu offers an open bar with specialty cocktails, beer and wine, plus a midnight toast. To go with the libations, passed trays of bites will be served until midnight, including bruschetta, flatbreads and chorizo skewers. Booze & Bites drinks will be served until last call. Reservations for the prix fixe dinner are required and can be made by calling the O Hotel at (213) 623-9904, or emailing Azzi Kashani at azzi@ohotelgroup.com. Big Bar is living up to its name by celebrating New Year’s Eve nine times on Friday. Starting at 4pm, Big Bar will feature a different internationally-inspired cocktail every hour, so guests can welcome 2011 with friends around the globe. Add in a free champagne toast at midnight, and you’ve got the makings of a world-class New Year’s Eve. Copa d’Oro is already jammed on weekends, so on New Year’s Eve expect the volume at the Santa Monica nightspot to go to 11. Head bartender Vincenzo Marianella is bringing in reinforcements for the big night: according to a Huffington Post Q&A, Zahra Bates (Providence) will be joining Marianella behind the bar on Friday. Venues don’t get more stunning than The Edison, which is ringing in the new year with its mix of cocktails, champagne and music. General Admission Tickets ($75) include a champagne toast and passed desserts at midnight. Premium Table Reservations start at $300 per table and include a bottle of copper-clad Beau Joie Champagne and a dessert plate. Entertainment will be provided by The Yard Dogs Road Show, a “hobo cabaret” that fuses Vaudeville with modern rock. First & Hope is doing the bi-coastal thing with its New York New Years celebration, featuring East and West Coast countdowns, champagne toast, live music, and a Best Cocktail Dress & Sharp Dressed Man contest. On New Year’s Eve, First & Hope is offering several prix fixe dinner seatings, with the earliest one beginning at 4:30pm. Update 12/22: First & Hope has announced that Alain Giraud will be the guest chef on New Year’s Eve. Pricing and details for the prix fixe dinner options have also been revealed, with seating available in the main dining room or in Fedora, featuring Brenna Whitaker. First & Hope is giving away a New Year’s Eve prize package (valued at over $500) that includes a pair of tickets to see New Year’s Eve with Kristen Chenoweth at Walt Disney Concert Hall, plus dinner for two at First & Hope. Tickets are for the 7pm concert, and a gift card to First & Hope is for $200. The contest ends at noon on Dec. 29, and the winner will be notified that day. To enter, visit www.firstandhope.com/nye/. 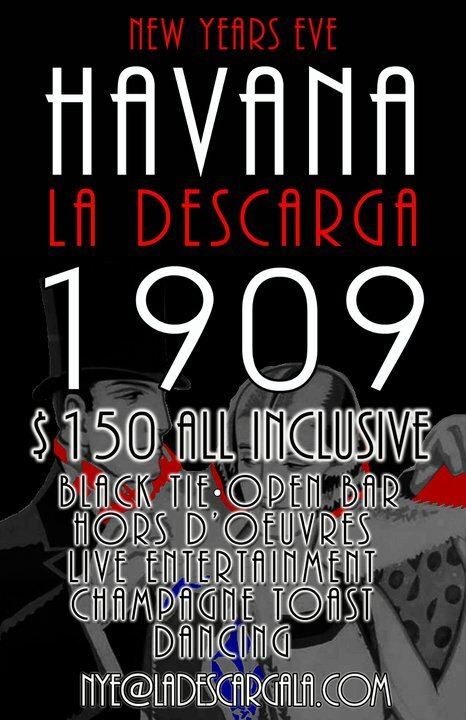 For its first New Year’s Eve celebration, La Descarga is using the Wayback Machine to transport guests to an elegant black tie affair set in Havana, circa 1909. Included in the $150 ticket is an all-night open bar, champagne toast, multi-course apps and desserts, live music and dancing. And to ensure you have plenty of room to shake your money maker, attendance for Havana 1909 will be limited to 150 guests. 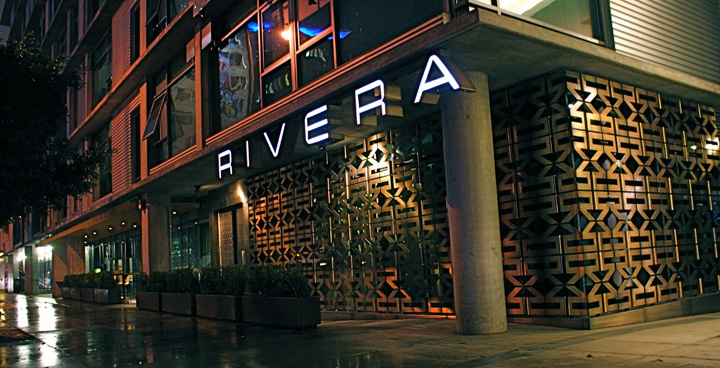 Unlike the open bar frenzy of last year, Rivera mixologist Julian Cox will be mixing a couple of New Year’s Eve cocktails to pair with the Prix Fixe Dinner menus. The First Seating will be five courses for $70 per person, and the Second Seating will be seven courses for $100 (includes champagne toast). The Tar Pit – A Revival, Happening. For a swellegant New Year’s Eve, The Tar Pit is offering cocktails, champagne and passed apps for an all-inclusive $95 admission. Vintage Trouble performs “live-wired, straight-shootin, dirty-mouth’d pelvis-pushin’ juke music” starting at 10:30pm.